There is a plant that literally sends into raptures our cats but also has many benefits for humans : it’s called “Nepeta Cataria” (synonyms: Cataria Vulgaris, Calamintha Albiflora, Glechoma Cataria, Nepeta mollis). It’s also known as catnip, catmint, catswort, cat’s heal all, cat’s-play or even cat grass. For our feline friends is a real “drug”, although beneficial, because it has no harmful effects and gives no addiction, but for us it is a mild sedative with digestive action. The term Nepeta indicates a genus to which they belong about 250 species, growing wild mainly in temperate areas of Europe and Asia, up to an altitude of 1200 m, preferably in uncultivated areas and in the rubble of old buildings. It is also naturalized in New Zealand and North America. The species Cataria is very easy to grow and require very little care. A curiosity. The name “Nepeta” seems to be attributed to Nepe, ancient Etruscan city of modern Tuscia in Viterbo province (Lazio region of central Italy), conquered by the Romans after the fall of Veii (396 BC), in whose territory the plant grew very abundant. The term “Cataria” derives from the Latin word catus (cat) for the strong preference of the felines. Of the Lamiaceae family, it’s a herbaceous perennial plant, characterized by erect and branching that can exceed one meter in height (normally 50-100 centimeters , or else 20–39 in). The light green stems are finely pubescent and 4-angled. The leaves are heart-shaped, toothed, gray-green color and hairy at the bottom, with serrated edge. The corolla is tubular, 2-lipped, and normally white (sometimes, it is light blue-violet). The hermaphrodite flowers (have both male and female organs), are white-pale purple or pink and gather in spikes like those of Lavender, bloom from late spring through autumn and are particularly appreciated by bees and butterflies. They don’t have a particular fragrance, however, the foliage has a pungent aroma that remember a mixture of thyme and oregano. The fruit is formed by four ovoid achenes, brown in color with a smooth surface, enclosed in the persistent calyx. The root system makes generous rhizomes. 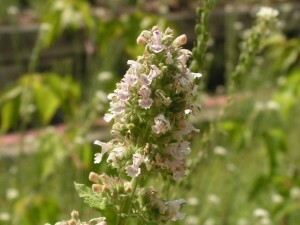 Catnip often produces clonal colonies from the rhizomes. In the past, Nepeta Cataria was considered particularly effective to cure the problems of the uterus and is believed to stimulate fertility, even curing female hysteria. Long been known in folk medicine for colds, headaches, fever, bruising and digestive problems. Because of its vague resemblance to the Melissa and Lavender, Nepeta Cataria is often used as a decorative plant in gardens. and even favoring the elimination of intestinal gas. Infusions and extracts are typically used as a sedative and antispasmodic, helping to improve digestive functions. Nepeta Cataria has properties similar to those of Valerian and is remarkable for its calming while favoring sleep. A strong infusion may be used to repel fleas from carpets or the fur of animals. The essential oil, however, is rich in carvacrol and thymol and is used to treat bronchitis, boasting antiseptic powers. And do not deprive yourself of sprouts, that can be used in cuisine to flavor the dishes of salad or meat. Nepeta Cataria can contribute well to combat headaches and even to treat fever. It finds also various uses in cosmetics, as it plays a perfuming, detergent and disinfectant action on the skin, revealing a great use for foot baths. A diethyl ether extract of this plant has been proved to have antimicrobial activity against fungi and Gram-positive bacteria. Furthermore, this plant seems to have very high repellent properties, not only for the mosquitoes (several Aedes and Culex species), ants and flea beetles, but also for mice and cockroaches. 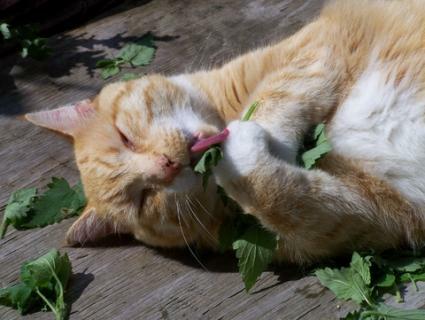 Finally, there is even an evidence that catnip can effectively kill flies. Cats are unique in their reactions to catnip: some cats seem to go crazy, others absolutely indifferent. If your feline friend belong to the latest category, do not desperate, especially if the kitten has less than 2-3 months or if he’s elderly. In the first case, his sense of smell is not yet fully developed while in the second it is likely that it has been reduced. In addition, 10-30% of cats does not respond to catnip, regardless of age. This is due to genetics; reactions to catnip is hereditary: some cats are genetically “programmed” to respond to catnip, some are not. Sensitivity to Nepetalactone is inherited by an autosomal dominant gene and is, therefore, a genetic trait (TODD NB, 1962). But if your feline friend react to Nepeta Cataria, you’ll see him sniffing, licking or biting this plant, rolling over and even lying down on it. The feline females in its presence would probably take the classic moves from mating (including meows and postures) and the older cats will even run and play as if they were kittens, after tasting it. It’s also demonstrated that cats can improve their mood simply sniffing this plant: the active ingredient in the leaves of this plant, the nepetalactone (similar to the pheromones in the urine of cat males), has a euphoric effect, aphrodisiac and rejuvenating, even on very lazy or elder animals. Not only cats, but also the big felines such as lions, tigers, leopards and lynx can be sensitive to nepetalactone. Little ones do not respond to this molecule until at least 6-8 weeks old and only towards the 12 weeks, they will react as adult cats. The assimilation pathway is not the intestines but the vomeronasal organ: to assume it is essential, therefore, that cats perceive the odor of the molecule. Nepetalactone is chemically a terpene, which mimics the effect of pheromones felines. It was noted that in the urine of male cats, especially when they are in love, there are pheromone substances similar in structure to nepetalactone: that’s why cats react to Nepeta Cataria with behavior of a sexual nature. Various uses can be, for example, rubbing the cat grass on his stub scratching post, you will convince the cat to leave in peace your carpets and curtains. Also, you could use Nepeta Cataria to get him meekly in his travel cage or, spreading a little on food, to invite an appetite animal to eat his food. No fear then, in making catnip available to house cats so that occasionally need to nibble the grass also to improve peristalsis and digestive function, as it provides useful substances such as folic acid and helps rid the stomach by hairballs. This plant is completely non-toxic to cats, even if, as a result of the consumption of a large amount of fresh catnip, you can check the reactions of vomiting or diarrhea, but this is rare and self-limiting. If your cat has this type of reaction, just take away the whole catnip or restrict its use. Finally, consider Nepeta Cataria not addictive: in the absence of it, cats do not show behavior that would suggest they feel the lack. Giving catnip herb to your beloved cat means offering the possibility of relating with an ancestral plant, savoring its flavor, enjoying a healthy and natural “drug”, without the danger of inducing chronic addiction. The relation of cats with any cat grass (Nepeta cataria, Dactylis glomerata, Teucrium marum, Valeriana officinalis) is generally seasonal, especially in spring, and these felines are not subject to any withdrawal symptoms during the long periods of the year when these plants are ineffective for them. Catnip is cultivated in drained soils, enriched with peat and manure. Nepeta Cataria resists both at high and at low temperatures and can be exposed both to partial shade and in full sun. At the implant time, fertilize with complex manure during spring, and depending on irrigation, during the summer. In general, it’s recommended 30 grams (1 ounce) of manure for deciliter earth. Suitable pH: acid, neutral and basic (alkaline) soils (it can even grow in very alkaline soils). Water regularly and avoid standing water. The blooming period (about 1-2 months) is during the summer or early fall. As for pruning, remove damaged and faded parts. The disease that can strike Nepeta Cataria is called “powdery mildew” and can be removed with special products based on sulfur. Repotting happens in larger pots in late autumn and early spring. Substrate is cultivated on drained land, enriched with peat (coal) and complex fertilizer. Propagation is made with planting in spring or with the division of clumps, planting again and leaving 30 cm (a foot) of open ground between one and the other. The seed remains viable for about 5 years (source). 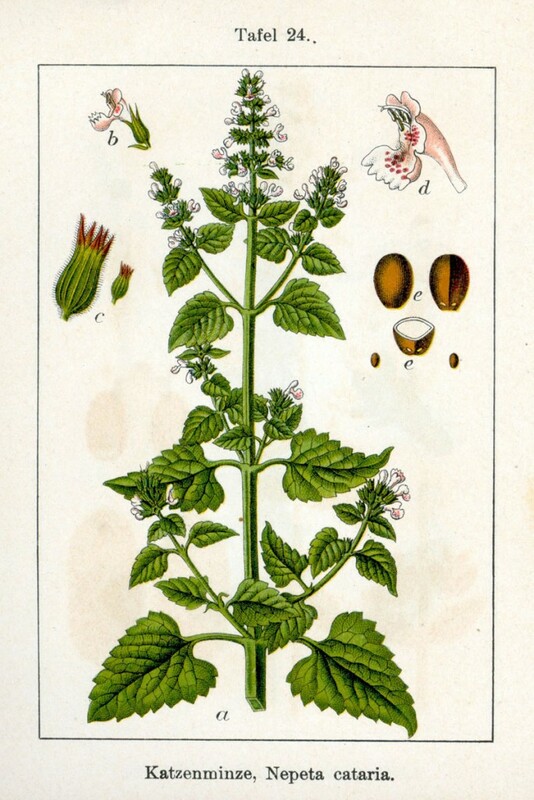 Nepeta Cataria may be used while cooking to flavor meat (most of all pork and game), to enrich salads, to prepare a refreshing drink or as an alternative to tea. The dried leaves are sometimes used to flavor tobacco. With Nepeta Cataria you will make your cat happy, but do not forget the humans beneficial properties of this valuable medicinal plant. With the infusion, you may cure the common cold, fever and even the most stubborn hiccups. Put in boiling water 1 teaspoon of catnip chopped fresh leaves, leave for up to 10 minutes and drink, sweetening to taste. Use the mother tincture (max 30 drops) instead in cases of insomnia and nervous agitation. I hope this small guide will help you understand better this wonderful plant, which makes go crazy our beloved cats but has also many other properties. Please use catnip for personal use with caution and only on prescription and supervision of a doctor or of the herbalist. The properties and indications of this herbal plant are given as a guideline only, and do not constitute any kind of consultation or prescription. NepetaCataria.org recommends you also to run an independent verification.